School bus drivers play an important role in helping children receive their education. For many students the school day begins with a safe and pleasant bus ride to school. To ensure the safety of everyone aboard the bus, the bus driver must focus his/her full attention on the road. The safety of all passengers depends upon the safe and proper conduct of each individual. School bus drivers receive specialized training to keep their passengers safe. School buses are specifically designed and equipped with unique standards designed for optimum passenger safety. Wait until the bus has stopped and the door opens before stepping toward the bus. When you board the bus, go directly to your seat and sit down. Loud talking or other noise can distract the bus driver and is not allowed. At your stop, wait for the bus to stop completely before getting up from your seat. Then, walk to the front door and exit, using the handrail. Rules for Getting On and Off the School Bus . . . Millions of children in the United States ride safely to and from school on school buses each day. Although school buses are the safest way to get them to school, an average of 33 school-age children die in school bus-related traffic crashes each year. Most of those killed are pedestrians, five to seven years old. 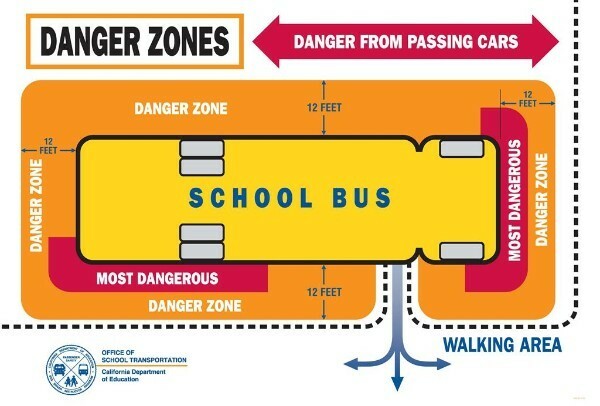 They are hit in the danger zone around the bus, either by a passing vehicle or by the school bus itself. It is illegal for a car to pass a bus with its red lights flashing.